NYC Sketchfest at The PIT is this weekend and as we mentioned last week, Philadelphia will be represented by a plethora of groups. This week, musical sketch group Mean Wendy Band gets ready for their two shows at NYC Sketchfest with a local performance at Philly Improv Theater (PHIT) with musical improv duo, Cat & Vegas and the Temple of Boom. Not to be outdone, musical sketch/90’s alt-rock cover band The Flannel Chucks are also back on stage. PLUS, a brand new show from PHIT Sketch House Team Dog Mountain with guests Adventure Friends, Sweetish at The Sideshow, and an opportunity for anyone to get their material on stage at Sketch Up or Shut Up. Dog Mountain returns to the PHIT stage this week and next for their latest run of sketches entitled, ‘No Cussin’ on the Mountain’. This run is bittersweet as it marks the final show the group will have with original member, Rob Baniewicz, who is moving New York City to pursue his dream career as an Elmo impersonator in Times Square. Okay, that’s not totally correct, but he is moving to New York City and this is a big deal. Rob is one of THE seminal figures in the Philly sketch comedy community as one-half of sketch duo, Meg & Rob, as well as writing & performing for Camp Woods and Alley of Nightmares, a sketch show based on horror anthologies such as Tales From The Crypt, Alfred Hitchcock Presents and The Twilight Zone. Dog Mountain is Rob Baniewicz, Carl Boccuti, Chip Chantry, Jim Grammond, Emily Hill, Trevor Miles, Joe Moore (Head Writer), Courtney Painter, R.J. Payne, Steve Swan, and Ashlee Rose Toll. They are directed by Carl Boccuti. Adventure Friends are also back this month, opening for Dog Mountain. 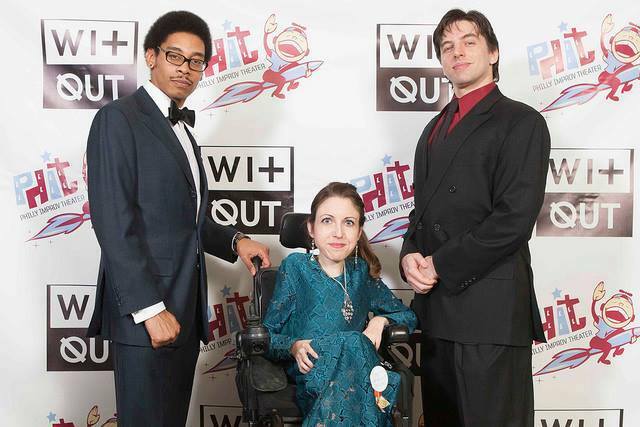 Quinton Alexander, Mike Butler and Shannon DeVido make up the members of Adventure Friends which take improv forms and turn them into sketch formats. 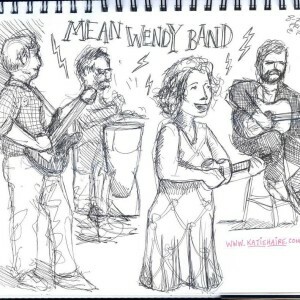 Mean Wendy Band performs original, silly songs penned by Philadelphia musical comedienne, Wendy Lenhart. Wendy’s mother always said that “if you don’t have anything nice to say, don’t say anything at all.” However, she didn’t say anything about singing not nice things. Mean, not-taking-her-mother’s-advice, Wendy is backed up by her favorite guy-pals, Ryan Barlow, Brian Kelly, Dan Kristie and Zachary Wisely. Despite the intentions of their name, they’re really quite nice people. Joining Mean Wendy Band on the show, Vegas Lancaster and the lovely Cat London as musical improv duo, Cat & Vegas and the Temple of Boom! Philadelphia’s only(?) 90’s alt-rock, comedy cover band returns to the stage fresh off of this summer’s incredible Flannelpalooza Chuckoachella for another HUGE musical comedy showcase. This time it’s all to benefit local organization, Rock To The Future, a 501(c)3 organization founded in 2010 that provides music education to Philadelphia’s under-served youth at no cost to them or their families. Joining the Flannel Chucks’ Beth Eisenberg, Neil Engelman, Rob Alessiani, Brian Kelly, Ryan Barlow, and Kristen Schier will be Cat & Vegas and The Temple of Boom, The N Crowd, Matthew Schmid of The Flat Earth, a performance by Rock to The Future + a live segment taping for Best Friends TV Show with Ryan Birchmeier & Steve Holland. The Sideshow was created by Mike Marbach and is PHIT’s variety showcase for all types of comedy in one convenient slot. You want to see improv? We got it. Stand-up? Yup. Sketch? You betcha. And a ton of other funny things that don’t quite fit into any one category. From established acts to one night only groupings to experiments gone wrong… the Sideshow has it all! This installment is hosted by the cast of the upcoming STAY DEAD!! and features sketch from Sweetish , Jack O’Keeffe’s, ‘Charlie Harley’s Acting Semenar’, Caitlin Wiegel (ManiPedi/House of Solitude) performing ‘Mrs. Linda is in Barbados’, ‘Ghost Stories’ by Jake Mattera (HoagieFist), improv from Neighborhood Watch and clowning from Kristen Schier. « Congratulations, Thank yous and Safe Travels to Barbara Bush!